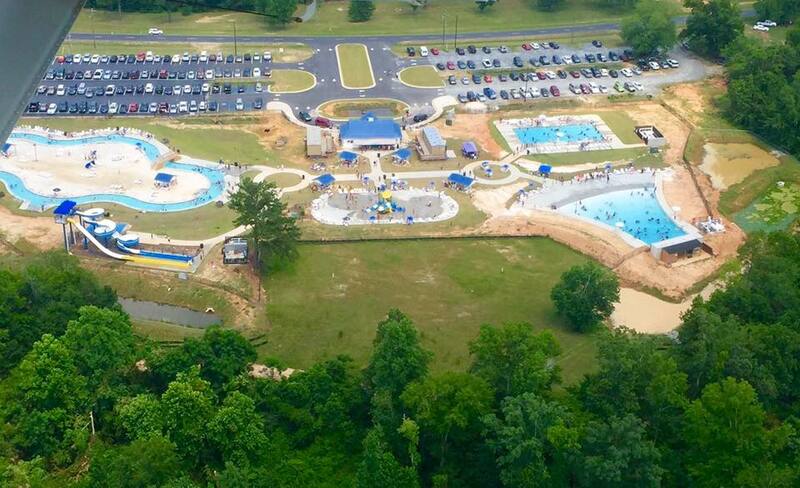 Aerial view of Sandy Beach Water Park. Photo from their Facebook page. Sandy Beach Water Park opened at Lake Tobesofkee in July 2015. Last year’s mid-season opening meant that many Macon-Bibb residents missed their opportunity to visit the park. Don’t make the same mistake this year. Admission to Sandy Beach Water Park is $12.50 for most visitors, but discounts are available for children under 42 inches tall, military families (including children), and senior citizens. Visitors must also pay the $3.00 per person (age 7 and up) entry fee for Lake Tobesofkee, so the price is actually $15.50. The water park has a 600 foot lazy river; a plunging water slide; a spiraling water slide; a little kid’s splash pad, with dunk buckets, squirters, and small slides; a wave pool; and a swimming pool. With the exception of the water slides and splash pad, the water depth ranges from 3 feet to 5 feet deep. Be advised that no floats are allowed in the park except Coast Guard certified PFDs (personal floatation devices). They have a large number of PFDs available in different sizes, from 30lbs to adult. But if you are big and tall, or you have a toddler, you may want to bring your own PFD. Sandy Beach Water Park also has pool inner tubes to use in the lazy river and wave pool, including smaller tubes with bottoms for babies and young children to sit in. Visitors can also free float/swim through both attractions, but the current in the lazy river is fairly strong. Sandy Beach Water Park. A clean fun place for family fun. The level of safety at the park is unparalleled. There are many life guards on duty at every attraction, and they take their jobs seriously: each one of them is focused on the crowd in the water, not looking at cell phones or talking to friends. Children and teens were appropriately behaved, and when guests made dangerous choices (trying to ride the lazy river upside down in an inner tube with their heads under water! ), they were quickly called out for it and stopped by the lifeguards. Although visitors are not allowed to bring food or drinks into the water park, they can get a handstamp for re-entry if they leave to eat picnic lunches elsewhere around the lake. There’s a food station, though, and its prices are reasonable, with most items costing between $3 and $5. Plentiful garbage cans and attentive staff help enure that the grounds are clean and free of litter. Sandy Beach Water Park is a great location for families of all ages to have fun. Children must be accompanied by parents at all times in the water park, and the result is well-behaved young people enjoying the water in a safe, clean environment. Plan to go early and spend the whole day because –guaranteed– your children will not want to leave.